Illuminating the backyard or the front porch is not difficult but doing it in style can be challenging. Whether it is the patio or deck, you should consider an outdoor table lamp for lighting up the outdoors in a progressive, aesthetic way. The soft glow of an outdoor table lamp can transform such spaces into inviting spaces for relaxing in the evening or having a meal. Crafted to exude elegance, these lamps are crafted with premium materials. Picturesque and easy to install, these lamps stress the overall aura of the outdoors. 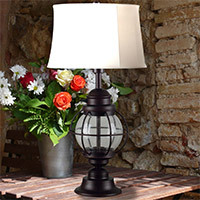 Our choice of outdoor table lamps exemplifies the highest quality of craftsmanship with exceptionally built oil rubbed bronze lamps and incredible hand carved lamps. Personalize and decorate your personal outdoor space with tastefully selected lighting solutions, including supplies and accessories. Outdoor Table Lamps There are 10 products.